The truth is down there. A secret U.S. military dig has uncovered ancient ruins two miles beneath the ice of Antarctica and activated the ultimate weapon. Now rogue American archaeologist Conrad Yeats and beautiful Vatican linguist Serena Serghetti must team up to unlock the secret origins of human civilization before a global cataclysm ends it. Thomas Greanias builds excitement and suspense every step of the way in this daringly original, thought-provoking adventure that moves with electrifying force. This is the ultimate voyage, a journey to the center of time, as awe-inspiring as the dawn of man...and as inevitable as doomsday. This is Raising Atlantis. ©2005 Thomas Greanias (P)2005 AtlantisAudio, a division of Atlantis Interactive, Inc.
Raising Atlantis is like reading a weird hybrid between DaVinci Code and Stargate. Lets see, you have the annoying whiningly-superior academic protagonist: check. Obscure government experiment: check. Catholic conspiracy involving the Vatican: check. Someone who can decipher ancient codes and text: check. Someone spouting cryptic religious messages: check. Characters with extremely dysfunctional parents: check. Pyramid and Alien connection: check. All that was missing was a Tielk-like sidekick, and Robert Langdon's obscure preaching about cryptic philosophical points... Oh wait... There's Conrad. Then there's Conrad. Golly, if I have to listen to Conrad whine one more time about how his daddy don't love him as much as he loves his military career, I wanted to slap the character. Seriously, did anyone like Conrad? He was whiney, irritating and self-centered. I don't blame his dad for wanting to throw him in the brig. I think this book had some great adventure. But I can't help but wonder what it would've been like with protagonists I actually LIKED. 4 stars. I have read review after review of this book that proclaim it to be horrible drivel with *maybe* a good idea for a story but was badly realized with characters that were poorly developed, etc. Well, for this genre, I couldn't disagree more. I came back here to see if there was a sequel because it was clearly setup for one, and I enjoyed this book so much I am looking forward to it. It should probably be loosely categorized in the Science Fiction genre, not Suspense, and especially not Espionage. There is definitely a lot there to work with, and I enjoyed it immensely. All books of this sort require total suspension of disbelief. But that's why it's called "fiction". If you take the various "facts" that are presented, about the characters and about what's going on, at face value and start from there, the book is quite compelling. I am not the only one to think so, apparently. It achieved #1 Amazon sales ranking in April 2002 and #2 on Amazon’s eBook fiction list (Mysteries & Thrillers) in May and June 2003 behind Dan Brown’s THE DA VINCI CODE. It was reported to be on the NY Times Best Seller list, but I was not able to confirm this. At any rate, I recommend it to anyone who enjoys reading Atlantis-themed books. It may not be the best book out there, but it is most certainly an enjoyable read. A good yar filled with bits and pieces of other good yarns a dabbling of current events, some religion for those who need some nd unfortunately, once again, the salvation of the world is dependent on superstition and judeo/christian dogma. The hero takes a 20 foot leap to a stone floor with no damage to his ankles, the heroine falls 30+ from a helicopter and is unharmed all in all a bit "over-the-top". Your never quite sure if science or reason has any place in the tale and by the time you've decided, none, it gets even more bizarre with the never-ending end that seems to go on and on and on. 3 stars is the best I could do for this audiobook and those only because the "graphics" or visuals created by the story are truly wonderful. I'm a sucker for special effects. Is hard to believe that this is not a Dan Brown Novel, Thomas Greanias has done a remarkable job in assimilating Dan Brown's formula. This book will have your heart pounding from the start. Just as Dan Brown's (Deception Point, Angels & Demons and Da Vinci Code) this book is a synthesis of facts and fiction. In addition, the excellent narration of Scott Brick gives this book a perfect 5 STARS!!! "THIS IS A MUST HAVE"!!! This is the worst book I've ever finished. It is a bad attempt at a redo of Raiders of the Lost Ark meets the Day After Tomorrow. (Unless Day After Tomorrow was based on this book, in which case I apologize.) There were no characters that I cared anything about. In fact, I was hoping they would all die so the book would just get over. The story was predictable at first and then it just became impossible. This book was so bad that Scott Brick couldn't even save it. Actually, even Scott was subpar here with a bad Australian accent. I did give the book one star because I do love Scott Brick even at his worst. A preposterous story strung together with cliches and characters who are uniformly arrogant, angry, and sarcastic. I stopped listening when I realized that I wanted each of them to meet a bad end. This was an amazing book. If you?re into ancient civilizations, celestial mysteries and modern technology that doesn?t match up to mysterious nature of the pyramids you will love this book. Shrouded by the US trying to keep a secret discovery found miles beneath ice under wraps things get dicey when other countries fear a ?secret nuclear test site? of the Americans. 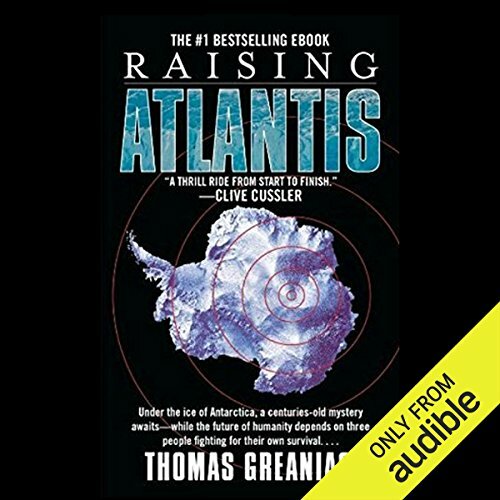 This book is an interesting read for Atlantis enthusiasts. To suspend your disbelief enough to swallow the outlandish happenings in this tiresome tale. They should also help with the simplistic characters and repetitive "He screamed!" and "She froze!" passages that seem to be on an endless loop. I used to think I could listen to Scott Brick read the phone book. This drivel proves my assumption wrong, even he can't save it. I've only just started this epic tale and have only one complaint to address at this time. Scott Brick is a great narrator, but really? "Your 'Oliness"????? Australians do not speak with a Cockney accent! A linguist who grew up in Australia would not speak like she had just finished a run in "My Fair Lady." This and this alone might keep me from continuing to trudge through this poor cousin of Mr. Brown's Code. Aaargggghhh!